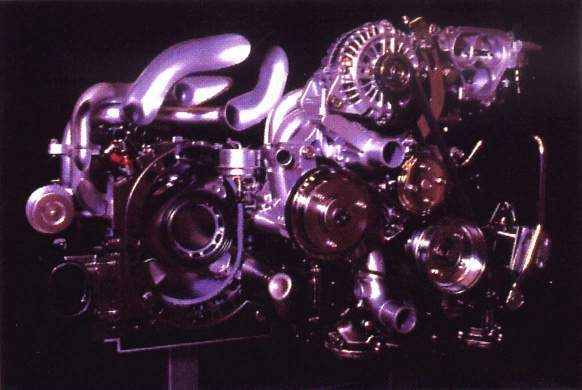 Mazda has been developing a significant variant of the evergreen, type 13B, twin-rotor Wankel engine. Mazda's series-production rotaries have always employed side intake ports and peripheral ports. In the prototype engine, both intake and exhaust ports are located in the side-housings. Mazda discovered that the side-exhaust port engine's fuel consumption has been significantly improved, because of its ability to run on leaner air/fuel ratios, of improved internal EGR ratio, and of high combustion stability over the entire load range. The side-exhaust engine has lower HC emissions, 35-50% less than those from the peripheral-port engine. front wheel axle-line, in a true "central midships"
manner. It employs dry sump lubrication. The experimental engine, naturally aspirated and fuel-injected, is promising in its performance, producing 164 kW (JIS) at 7500 rpm and maximum torque of 216 N·m at 6000 rpm. 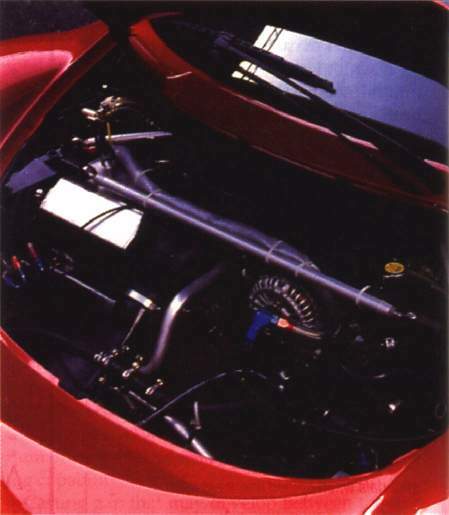 The engine adopts dry-sump lubrication, which allowed its lower and rearward installation in a concept 2+2 sports coupe, Mazda describing its position as "central midships." The engine's output shaft height has been lowered by 55 mm, and its position pushed back by 205 mm, placing it well aft of the front-wheel axle line. This enabled Mazda designers to slant the car's nose sharply. The engine's position has achieved an extremely low polar moment of inertia, providing the concept car with outstanding dynamics, reports Mazda.